10:20pm ET: Jerry Crasnick says the Yankees made Torres, Andujar, Justus Sheffield, and Estevan Florial off-limits during trade talks with the Pirates. They were willing to trade Frazier or Chance Adams for Cole, but not both. 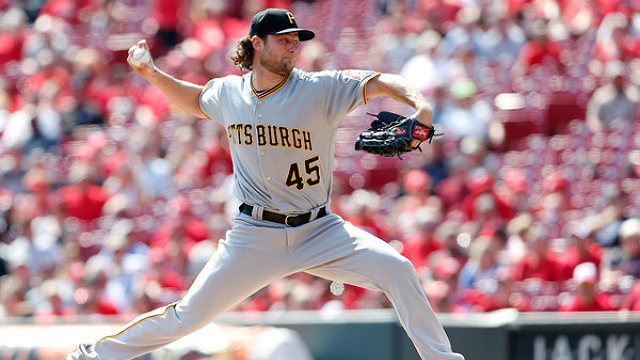 7:12pm ET: According to multiple reports, the Astros have traded for Gerrit Cole. For real this time. Headed the other way are right-handers Joe Musgrove and Michael Feliz, and prospects Colin Moran and Jason Martin. Musgrove and Feliz are big league relievers who might be able to start. MLB.com ranks Moran and Martin as the No. 5 and 15 prospects in Houston’s system, respectively. The Yankees had been connected to Cole for weeks, but the Pirates reportedly insisted on Gleyber Torres, and that was never going to happen. Brian Cashman & Co. wanted to build a package around Clint Frazier which, as J.J. Cooper noted, would’ve been better than what Pittsburgh actually got from the Astros. Jon Heyman says the Pirates wanted Miguel Andujar as well, and the two sides were never close to a deal. With Cole off the board, the Yankees figure to move on to other pitcher trade targets, such as Michael Fulmer, Chris Archer, or Patrick Corbin. They’ve been connected to all those guys this offseason. Clearly the Yankees want a potential impact pitcher, not just a depth arm. That said, they have five starters already, plus some nice depth arms, so another pitcher isn’t imperative. 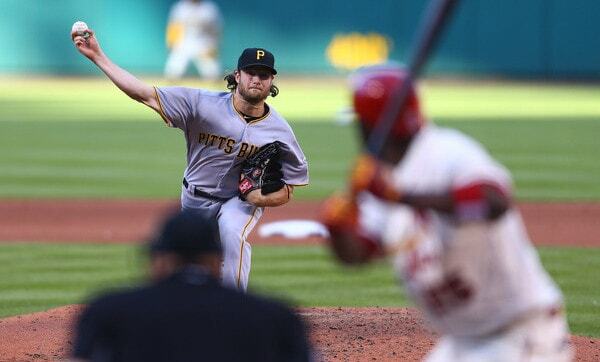 Despite rumors to the contrary, right-hander Gerrit Cole remains a member of the Pittsburgh Pirates. That could change at any moment! But this morning it seemed like he was heading to the Astros, then he wasn’t. Last month it appeared Cole was coming to the Yankees, but then he wasn’t. It’s been an interesting few weeks. All of this is posturing, of course. Are the Yankees still interested in Cole? Yes. Are the Astros still interested in Cole? Also yes. Do the Pirates want to trade Cole? Probably not, but they realize they won’t be able to sign him long-term, so a trade is the next logic step. A lot has happened lately and yet nothing has really changed. The Yankees have five starters for five spots at the moment, and because of that, I don’t see them rushing into anything. They’re not going to be spooked by reports of their top target possibly going elsewhere, and they won’t be pressured into upping their offer. Brian Cashman has done a pretty excellent of job being patient and making deals on his terms the last few years. I don’t see that changing. If anything, this morning’s Astros-Cole stuff is a reminder the Yankees are not the only fish in the sea. Even with his down season, Cole is a very talented and in-demand pitcher, and another team can swoop in with a quality offer at some point. That’s a risk the Yankees are apparently willing to take, that being patient could mean missing out. For all intents and purposes, the Yankees have 1-2 holes left on their roster: Second and third base. It’s easy to see Gleyber Torres taking one of those spots by May 1, if not Opening Day, hence why it’s 1-2 holes and not a firm two. How they fill that last hole could be creative or it could be as simple as sticking Ronald Torreyes there until a younger, more talented option emerges. Yet day after day, the Yankees are tied to starting pitchers. Gerrit Cole, Michael Fulmer, Chris Archer, Patrick Corbin, etc. Heck, even Yu Darvish, a pitcher who appeared (or still appears) to be wildly outside the Yankees’ budget-conscious price range this offseason. Part of these constant rumors may be to drive up the price for fellow contenders, but I have a feeling it goes beyond just that. While an optimist would say that the Yankees are already set in the rotation, I’m here to advise you otherwise. Finding another starter — whether in free agency, a trade or otherwise — is not a luxury, but a necessity. Why do the Yankees need another starting pitcher? After all, they retained both potential free agent losses with Masahiro Tanaka and CC Sabathia. They acquired Sonny Gray in part due to his remaining control years. Luis Severino and Jordan Montgomery earned spots in the 2018 rotation with their superb 2017s. But each of those five pitchers comes with significant question marks. Perpetual knee issues or partially torn UCLs for some and 2017 workloads well past their career-highs for others. If there’s an argument for how the 2018 Yankees are worse than the 2017 Yankees, it starts with things going wrong health-wise in the rotation. The scary thing is that rotation-based argument is easy to make. Just like each of the pitchers in the Yankees’ rotation, there are flaws with each of the available pitchers. Gerrit Cole couldn’t avoid home runs in 2017 and has only one ace-like season, yet the Pirates are asking (as they should) for the moon in exchange. Michael Fulmer comes with more control, but perhaps even more in return and he did just crater in the 2017 second half. Free agents like Darvish and Arrieta are on the wrong side of 30 with big money demands. The Yankees could very well determine that their best option for that sixth starter already lies in house. That’s valid. Watching what Chad Green’s done in 114 MLB innings makes you wonder how well he can do in a swingman role and perhaps 20 starts next year. Having a packed and reliable bullpen already makes a transition to the rotation possible for Green. And the Yankees’ farm system is filled with intriguing arms that could be MLB ready. Chance Adams, Justus Sheffield, Domingos German and Acevedo. One of those guys could break through and provide the starts that will be necessary beyond the Yanks’ top five guys. The team doesn’t need to go out and spend big on Darvish or trade top-end prospects for Cole. That’s not what I am implying. In fact, the Opening Day and playoff rotations may already be set in the Bronx and going big on the trade or free agent market may be a misallocation of resources for a team that still has a need on the infield. Making either one of those moves would put the Yankees more firmly ahead of Boston in the AL East arms race and give them another weapon to match Cleveland and Houston come playoff time. It would answer a lot of questions that exist about the team as currently constituted and would allow them to ease the workloads of Severino, Montgomery or anyone they deem necessary to protect. Like with the Giancarlo Stanton deal, the free agent market may move in the Yankees’ favor. That’s much less likely with the trade market: The Tigers, Pirates and others can wait for a more desperate team in July or even 2019. But no free agent has received a deal of more than three years this offseason and an unforeseen bargain may be out there in February. The solution to their pitching concerns may indeed exist within the organization already and that’s why it’s not worth panicking if they don’t make a move. But when the Yankees are tied to starting pitchers for the next few months, don’t scoff. There is a need on the roster and whether it can be filled in-house remains to be seen. Friday (10:33am ET): Momentum toward a trade may have been overstated last night, report Heyman and Feinsand. The two sides are talking, but nothing is imminent. Thursday (11:43pm ET): According to multiple reports, the Yankees and Pirates are inching closer to a Gerrit Cole trade. It does not appear a trade is imminent, but earlier Thursday we heard talks had cooled, and apparently now they’ve fired back up. The Yankees have been connected to Cole, their 2008 first round pick, since the Winter Meetings last week. Cole, 27, is under team control as an arbitration-eligible player in 2018 and 2019. He had a 4.26 ERA (4.08 FIP) with 23.1% strikeouts and 6.5% walks in 203 innings this season, making it his worst MLB season. Cole allowed 31 homers in 2017 after allowing 34 homers total from 2013-16. I said pretty much all I had to say about Cole earlier this week. I am on board with adding another starter but I don’t love the idea of trading Frazier for Cole, who has been decidedly average the last two years. Can he be better than average? Of course! Cole can be an ace. He has that potential. But he’s gone backwards the last few years and that worries me. The offseason has been moving pretty slow overall, and things figure to slow down even more with the holidays right around the corner. Boring! Anyway, earlier today we heard the Yankees still have some interest in Yu Darvish. Here are some other miscellaneous hot stove notes. Jacoby Ellsbury might consider waiving his no-trade clause for “a select few teams,” reports Jon Heyman. The Giants could be one of those few teams. San Francisco needs a center fielder and leadoff hitter after including Denard Span in the Evan Longoria trade, and they wouldn’t have to give up much to get Ellsbury. Just some salary relief. Ellsbury has a home in Arizona, where the Giants hold Spring Training. A few weeks ago it was reported Ellsbury wants to remain with the Yankees, though who knows whether that is true. He could be setting the stage for requesting some form of compensation for waiving his no-trade clause. Right now Ellsbury is essentially the fourth outfielder, assuming Brett Gardner, Aaron Hicks, Aaron Judge, and Giancarlo Stanton occupy the three outfield spots and the DH spot on any given day. Going to the Giants, who were terrible in 2017 but can at least create the illusion of contending in 2018, might appeal to Ellsbury. According to Buster Olney, the Yankees have been “digging into” background and scouting info on Diamondbacks lefty Patrick Corbin, which I take to mean they’re doing more than the usual due diligence. And of course I could be completely wrong. Probably am. The Yankees were first connected to Corbin during the Winter Meetings last week. He’s an impending free agent and projected to make $8.3M in 2018. I said this the other day, but I am a Corbin fan, at least in the sense that I would rather the Yankees trade for him than pay big for someone like Danny Duffy or Gerrit Cole. A southpaw with a 21.6% strikeout rate and a 50.4% ground ball rate would fit well in Yankee Stadium, in theory. I’m not sure whether Arizona is willing to trade him — they’d have to sign a replacement or roll with rookie lefty Anthony Banda — but if they are, he’s my preferred non-Michael Fulmer target. Talks with the Pirates about Cole have “cooled” since the Winter Meetings, reports Ken Rosenthal. I had a feeling this was coming. Pittsburgh figured to seek a massive haul for their ace and the former No. 1 overall pick, and the Yankees these days aren’t about paying big for anyone. Their current M.O. is buying low or waiting out the market until something falls into their lap. Hard to think that’ll happen with Cole. Also, don’t underestimate the impact of the CC Sabathia re-signing on trade talks. The Yankees have five starters now. They’re not desperate for anything. They can afford to sit back, see how the starting pitcher market shakes out (both free agents and trade candidates) in the coming weeks, then act accordingly in January or even February. If there are bargains to be had in free agency, great. If some team wants to trade a starter to clear payroll or whatever, that’s great too. The Yankees are the opposite of desperate right now. It’s pretty cool. Not surprisingly, the Pirates wanted Gleyber Torres in a potential Cole trade, according to Heyman. Of course they did. Pirates GM Neal Huntington wouldn’t be doing his job if he didn’t ask for Gleyber. Cole is their franchise pitcher. I would’ve asked for Torres if I were the Pirates. You never know when you’ll get Scott Kazmir for Victor Zambrano. It doesn’t hurt to ask. My guess is the Pirates will continue to have a high asking price for Cole and that’s cool. They should. But because of that, I don’t think the Yankees will be able to swing a trade, even by dangling Clint Frazier, who I have to think is generating a barrage of trade inquiries. I suppose the good news is there are way more pitching options out there aside from Cole, including some who are as good if not better, so the Yankees aren’t locked into talking to the Pirates. They can shift focus elsewhere. Speaking of Torres, Jack Curry says the majority of the Yankees’ decision makers believe Gleyber is a better fit at second base than third base long-term. He is said to be more comfortable at the keystone. I don’t think this means the Yankees are unwilling to play Torres at third base if necessary. If a trade for a quality second baseman falls into their lap, they won’t pass it up. They just prefer him at second. Given his defensive chops, Gleyber would provide more value at second base, the up-the-middle position. That isn’t to say his defensive ability would be wasted at the hot corner. Manny Machado and Alex Bregman are natural shortstops and their defense certainly isn’t going to waste at third. Ideally Torres would play shortstop, but with Didi Gregorius going nowhere, second base is the next best spot. The Starlin Castro trade opened up the position long-term for Gleyber.